state chapter, was abducted by masked gun men on the eve of the presidential and national assembly elections. It is over a week now and the where about of the man is yet unknown. Speaking to journalists on Thursday, his wife lamented about the nonchalance of elders in the state to intervene and help find her husband and probably rescue him. The gun men trailed him to his house in Abuja, flashed ID cards believed to be of the DSS. They would later tell his wife that they were acting on the Kogi state government's order and whisked him away in a van. All efforts to locate the young politician have been fruitless so far. 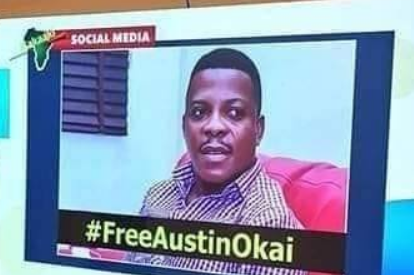 His friends and family members and a lot of Kogites have launched a #FreeAustinOkai campaign on social media. "I am so scared and worried about the safety of my husband," Mrs. Bridget Austin Okai said.